Learn more about the different ways we get your shipment there on time and in perfect condition. At ROBERT DAY FREIGHT AGENCY, we specialize in moving freight that is large, bulky, or just too heavy for other companies to transport. When you need something moved, we have the experience to get the job done. At ROBERT DAY FREIGHT AGENCY, we provide safe, reliable shipping services, and we specialize in hauling and transporting over-sized and heavy freight. Our Lancaster, New Hampshire-based company has been family-owned-and-operated since our opening in 1987. Over the years, we have gathered the best people and equipment to help you get any type of shipment where it needs to go. We take the time to load our trucks carefully, so you know that your valuables will arrive without any damage. We always work in a timely manner, according to deadlines that you set. From Canada to Mexico, we provide each client with personalized service by keeping them in direct contact with their driver. Ever trucker that works for us is given a cell phone, allowing us to maintain real-time tracking information. We also pay attention to any potential delays - including weather and traffic - and we know the ways to avoid them. 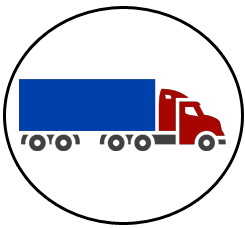 To provide claim-free, safe, and reliable transportation of your freight or commodities.